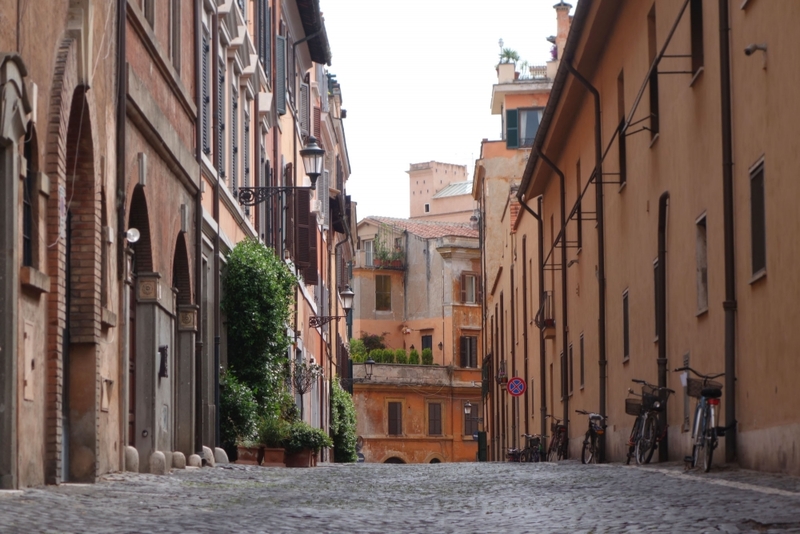 Rome is a city we have always wanted to travel to. 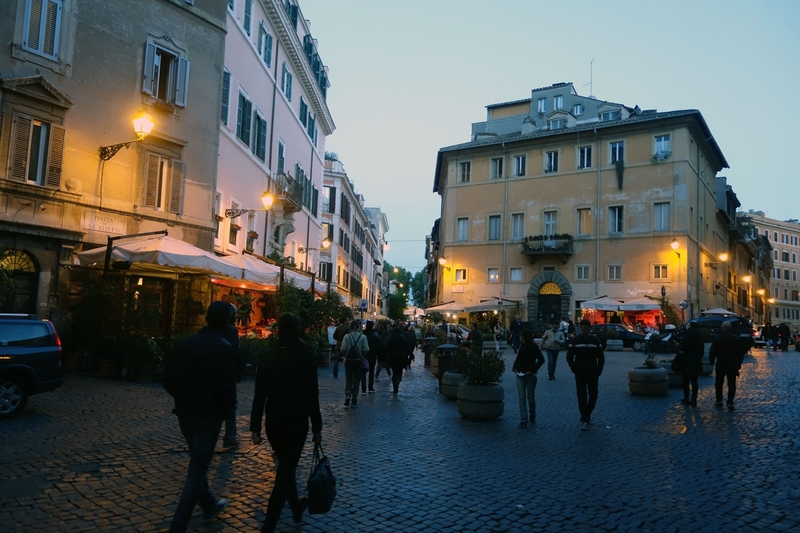 Alistair and I both love Italy having visited Tuscany and Milan in the past but we were drawn to Rome for its romance, its culture and of course, food! 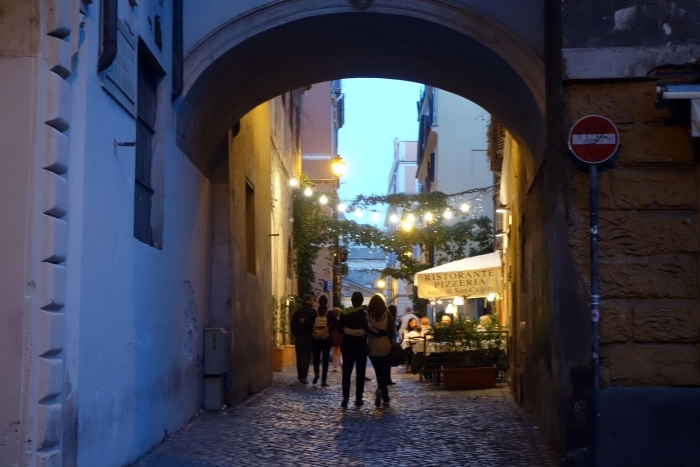 When we realised we were going to be able to go on a short break, we didn't even really have to think about where we wanted to travel - it had to be Rome. We decided to fly out on a Saturday morning and fly back on a Tuesday morning, giving us three days in the city. I shopped around a good bit looking for somewhere to stay and struggled to find a place that had good reviews, was centrally located and at a good price. This was partially our fault for travelling on a bank holiday weekend but I did eventually find a really nice BnB which was quite reasonable and within walking distance of the Vatican and right beside a metro stop if needed. It was clean and modern and had breakfast included so I would definitely recommend it as an option if you are still looking for accommodation. Below is a breakdown of what we managed to do with three days in the city. We never felt particularly rushed and we managed to fit in everything that we had wanted to see and do whilst we were there. After arriving at the airport, we found our way to the city via bus (you can read our article about getting from the airport to the city) and then used the metro to get to our BnB. Incidentally - the metro is very good in Rome, we did elect to walk quite a bit to be able to see as much of the city as possible but when we did use the subway, we never had a problem and it was cheap and reliable. After checking in, we went to have a quick look at St Peter's Square since it was so close to where we were staying. After satisfying ourselves with a few pictures, we headed for 'ancient Rome'. We decided to walk as it was a lovely day and we were excited to be in the city. This was actually the longest distance we had to travel in entire time (from the Vatican to the Colosseum). 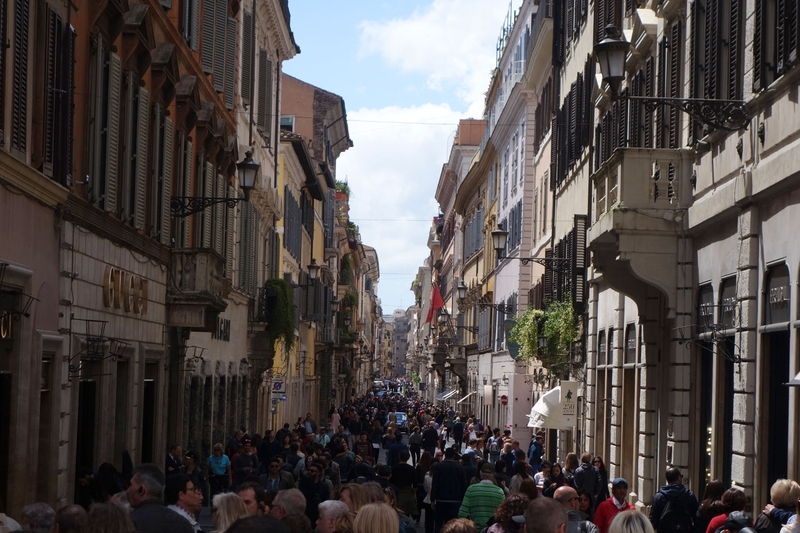 We walked via the Piazza Del Popolo and down Via Del Corso (one of the big shopping streets) and it still didn't feel like a very long walk. 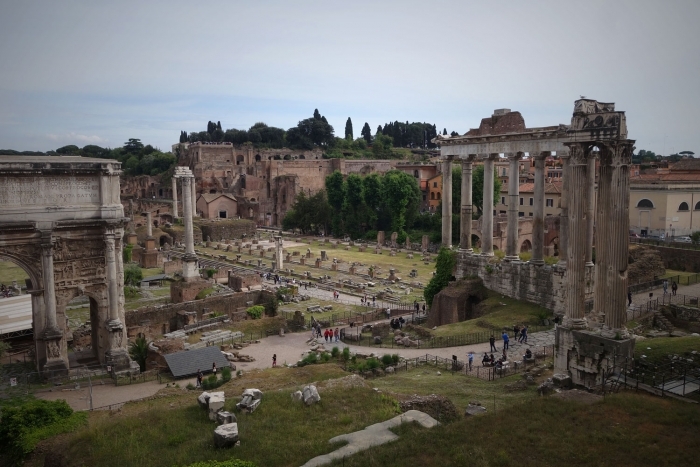 We started with Palatine Hill (you can read about getting tickets for the Colosseum, Palatine Hill and Roman Forum here) - we walked through some lovely gardens and ruins to get to a great viewpoint over the ancient part of the city. Walking from Palatine Hill to the Roman Forum there was a great place to take photos of the outside of the Colosseum - it was one of the first proper glimpses of the building we had, and so were drawn to get a closer look and on doing so found a great photo op! We continued into the Roman Forum proper and it was pretty cool! These ruins are more impressive than the ones on Palatine Hill and its awesome that you can walk amongst them and even touch them. 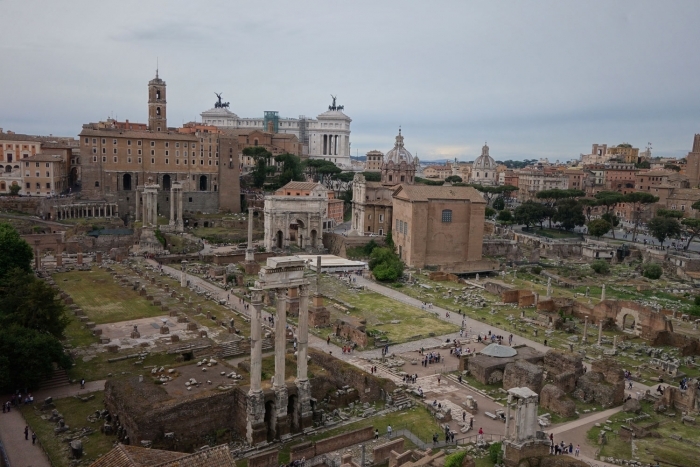 From anywhere near the Colosseum you can actually look down into the Roman Forum and get some great pictures but as you will probably be buying a ticket for the Colosseum anyway and this is included - it's worth going down into the Forum and getting a closer look. 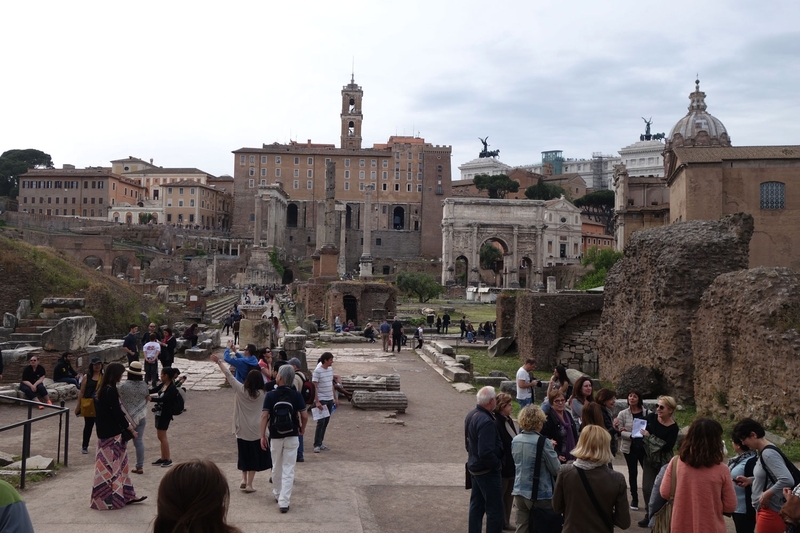 View from outside the Roman Forum, looking in. 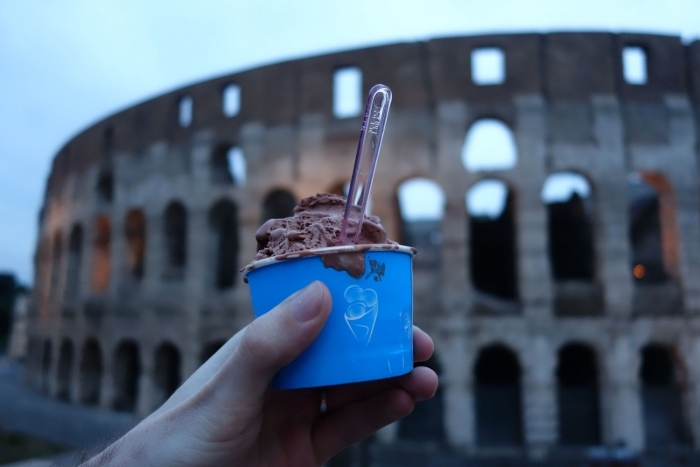 After grabbing a bite to eat and of course, some Gelato, it was time to do our 'Colosseum at Night' tour. 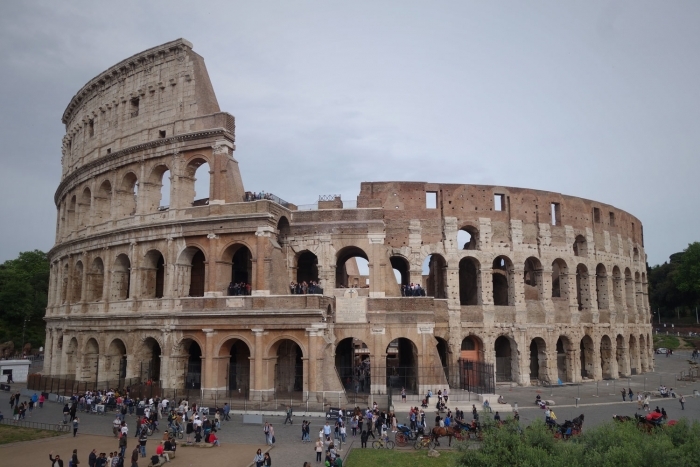 I've written a whole individual article about visiting the Colosseum and also how to visit at night so I won't go into detail here but I will say that it was a really amazing experience that I would wholeheartedly recommend! After a great breakfast, we started our day with a visit to the Vatican to see the Pope. This was a Sunday so we went to see the Angelus which is where the Pope gives a speech from his apartment window at Midday. Again I have written a separate article about the Vatican, including information about the different ways to see the Pope when you are in Rome if you are looking for some more details. After this we decided to hit up a few more of the classic tourist spots (via several Gelato shops). 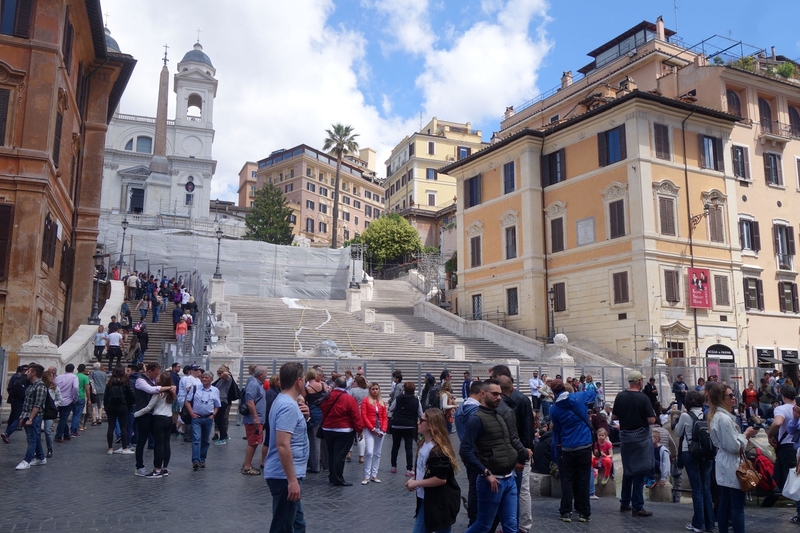 We started with the Spanish Steps which were very sadly under construction when we visited. We were unable to walk up the actual steps themselves but you could kind of see how impressive they would be without the building works. I thought the Spanish Steps were busy until we got to the Trevi Fountain. It was not at all what I had expected! It was in a very small courtyard with tons and tons of people crammed together trying to take pictures and throw coins into the fountain. It was definitely cool to see but I was a little disappointed in it and wish I had known beforehand what it would be like. After this we decided to use our ticket from the previous day to be able to visit the Colosseum in the daytime and wander around a bit more at our leisure. 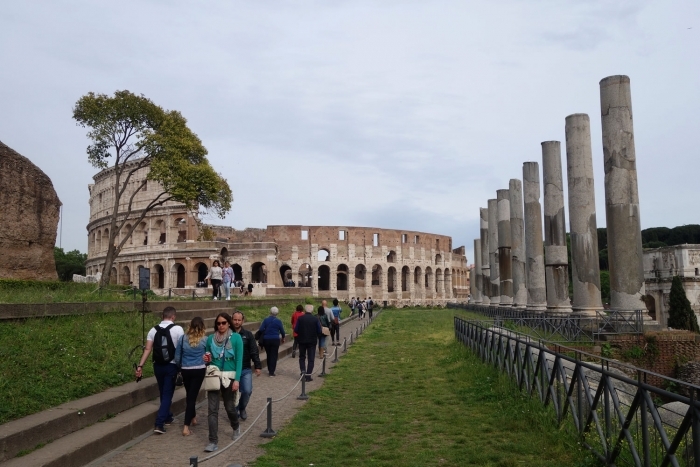 If you haven't already - you can read all about our visit to the Colosseum both during the day and at night here. Our evening was spent in the Trastevere area which was one of my favourite bits of the whole trip. 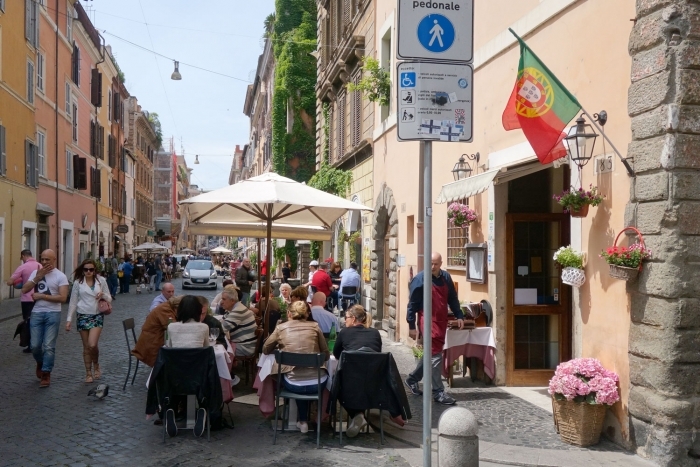 It is exactly how you picture an Italian city - small and winding cobblestone streets, restaurants with tables spilling outside, ivy growing up the walls - it was perfect! It was also one of the best nights of weather we had during the three days and so we managed to have our meal outside which made me very happy. 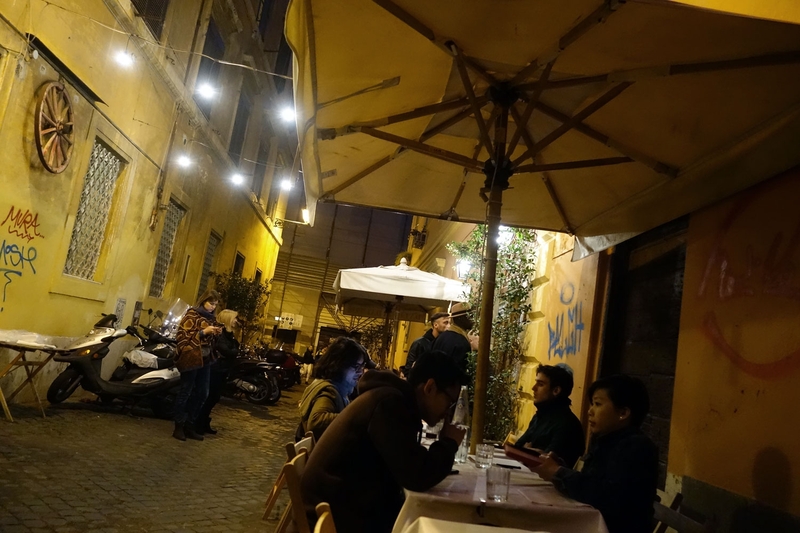 We ate at a place called Da Lucia which was so picturesque and the food itself was lovely - it definitely gets a recommendation from us although anywhere in that area is going to be very atmospheric no matter where you eat. The third day was our Vatican day; visiting the Vatican museums, the Sistene Chapel and St Peter's Basilica. 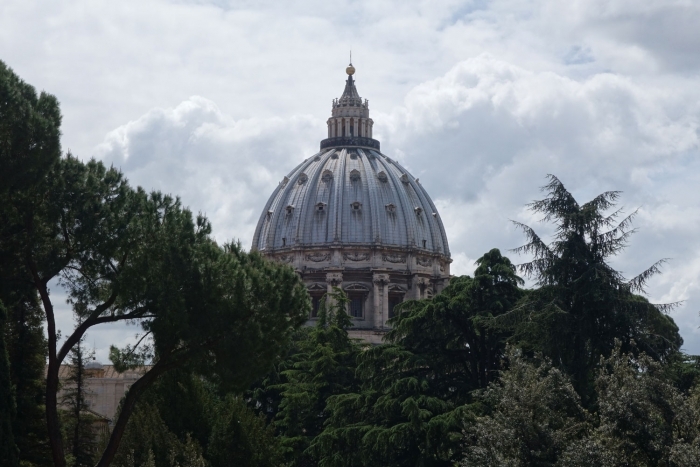 I have written a much more detailed post about visiting the Vatican, how to see the Pope and what there is to see in the area here but I'll pop some photos below to give you a feel for what the Vatican is like. 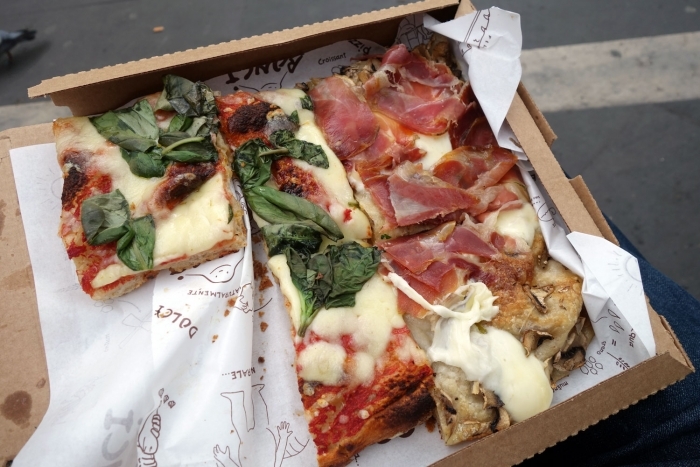 For lunch on this day we went to a well-reviewed Roman Pizza take-away called Bonci which is just outside the Vatican Walls. It was very popular and there was a bit of a wait to be served but the Pizza we well worth it! If you are spending a day at the Vatican I would say to avoid the expensive canteen food there and take a bit of a trip outside to taste some proper Roman pizza. Then it was off home again for us! I loved this short break to Rome and I will most definitely be returning in the future. It's a very easy city to visit with loads to see and do and such amazing food. It was everything we hoped it would be and if you are looking for a European city break, Rome is hard to beat.